You don’t need to stay in one of the Palms Fantasy Suites to get great bedding. The Palms uses some of the most popular by one of the industries leading makers, the Pacific Coast Feather Company. You’ll sleep comfortably every night knowing that you have one of the best and most popular pillows on the market today. The Palms relies on the Pacific Coast Touch of Down Pillow. Soft yet supportive, this pillow in pillow is designed for any sleep position and to make sure that you are comfortable all night long. An Inner chamber of duck feather and an outer chamber of goose down mean the touch of down pillow is truly the best of both worlds. Your pillow will be lofty and soft, yet as you set your head down it will be supportive and cradling. You may not be getting a full 8 hours sleep while in Las Vegas but when you finally do get that power nap you can awake refreshed with the Pacific Coast Touch of Down Pillow. The Palms ® trademark is owned by the Maloof Family. ; Hotelpillow.com has no ownership interest in and has not licensed the Palms ® trademark. The Palms ® trademark is used on this website for descriptive purposes to inform Hotelpillow.com customers that the Pacific Coast ® Touch of Down Pillow sold by Hotelpillow.com is the same down pillow found on the Palms ® properties worldwide. 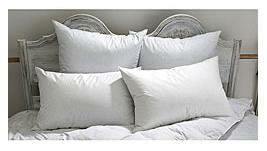 The Pacific Coast ® Touch of Down Pillow is not manufactured by the Maloof Family ®.